Liden Kirsten (Little Kirsten) has been called a Danish national opera. This is perhaps rather a grand term to describe this idyllic, not very long work, but it is certainly Andersen’s most popular musically dramatic text. The combination of patriotic theme, folk song style and the fact that the work is the result of collaboration between two of Denmark’s greatest Golden Age artists, has given it a status that few other Danish works of this kind have attained. 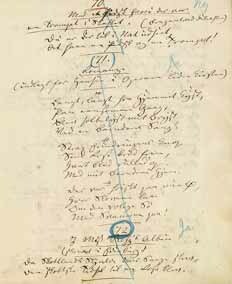 When Andersen visited Rome in 1833 he brought with him a collection of Danish folk songs, one of which in particular, “Herr Sverkel”, inspired him to write a dramatic play. However, it was not until January 1835 that he had completed the text of a ballad opera, Little Kirsten. In this he used the themes of some of these folk songs, a genre which at that time and during the following decades became very popular on account of the national interest they expressed. As he commented, “these ballads are a goldmine of subjects”. Andersen submitted his text to the Royal Theatre, and the idea was that a number of the songs should be sung to well-known folk melodies. But the censor accused the work of suffering from “emptiness, meagreness and dramatic poverty” and of having “an extraordinarily meagre plot”. Still, the text was accepted and given to the composer and orchestra leader Ivar Bredal, who was supposed to find and arrange the songs. However, although Andersen right until the end of 1835 kept hoping to see the music, Bredal never finished his work. About ten years later, Andersen was looking for a theme for an opera for his close friend, the composer J.P.E. Hartmann. So he took up the play again in February 1844, reworked it into one act, but did not have a fair copy ready until August/September that year. At the same time he showed the text to Hartmann. However, the play could not be submitted to the Royal Theatre until October 1844, where it was given a mixed reception. Johan Ludvig Heiberg wrote, for example, that “there is actually no real plot in it, but the situation is romantic and has a certain poetic air, which in conjunction with the music (if successful) could have a fairly attractive effect". Despite these cutting words, the play was accepted, and Hartmann received this news while travelling in Germany in October 1844. A month or so later the composer received the text, and apparently got well started into the music in the spring of 1845. But completing it took its time. Hartmann explained to Andersen in October 1845 that before the première of Little Kirsten he would like the “overwhelming Jenny Lind mood” to calm down a bit after the celebrated singer’s performance at the Royal Theatre. 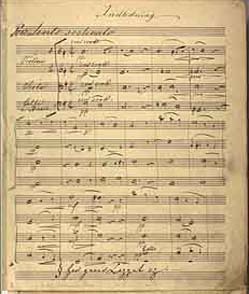 However, at Christmas time in 1845, Jonas Collin was able to write to Andersen in Berlin that the music was ready except for the overture. After some discussions at rehearsals during the spring of 1846 the opera finally had its première on 12th May – when Andersen was in the south of Italy. The cast included some of the theatre’s finest singers, with the soprano Pauline Rung and the barytone Christian Hansen in the leading roles. The reviews were generally positive, but the opera was not really popular with the public. People admittedly liked the music and the medieval theme, but Andersen’s text was still criticized for its dramatic weaknesses. Only four performances were given before the summer holiday in 1846, and there were not very many during the following seasons either. The patriotic theme was insufficient to ensure a complete success. The opera was not taken up again until the 1858–59 season and now divided into two acts instead of one. The interval in the performance proved to be a good decision, because now reactions were much more enthusiastic. A critic in one newspaper wrote: “...the reception on Friday bore witness to the fact that this agreeable composition has achieved the fully justified recognition that it was not previously given to the extent it deserves”. Since then the opera has been included in the Royal Theatre’s repertoire until 1955 – though with a few pauses. It has been performed in slightly altered productions that have not always appealed to the public’s taste, with a number of different leading soloists. However, Liszt was unable to conduct the première himself, but would take care of the final rehearsals. There was only one performance in January 1856 in Weimar entitled Klein Karin, which was apparently well received by the public. But when Andersen and Hartmann later tried to get the opera performed in Dresden, Meiningen and Munich they found to their cost that such a Danish opera had little chance abroad. It was never performed elsewhere. On the other hand, Little Kirsten has been performed more than 330 times in Copenhagen, more often than any other opera, and it is remarkable that by far the majority of these performances have taken place during the twentieth century. One of the opera’s best known songs is the antiphonal song “Hark, swain, say not no”. The text has been written in imitation of the folk ballad style with the two lovers who are throwing dice, first for possessions, garments, etc., and finally for their love. Throughout most of the song the young woman wins, but in the last verse it is the young man’s turn to be lucky, and the prize is the young woman herself and her love. The accompanying refrain is also in the folk ballad style. “It is the Danish heroic ballad’s own idiom that has arisen and unfolded itself” wrote a newspaper in 1870. In the autumn of 1846 Hartmann had already expressed his displeasure with the arioso sung by Sverkel, the leading character, just after his return to Denmark. 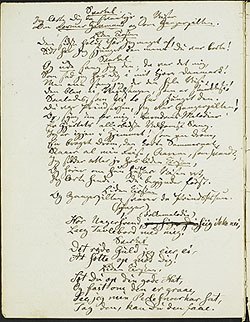 In November the composer drafted a suggestion for an alteration, and Andersen quickly wrote a new version. It was to become the now much loved “Sverkel’s Romance”, which is a frank declaration of love for the fatherland – a typical nineteenth-century sentiment that had no relevance to the Middle Ages, the period of the opera’s action. It is also as a romance that the song has proved such a success outside the context of the opera and has almost become national property, particularly on account of its patriotic content. Hartmann’s music MS for Little Kirsten, Act II. Andersen’s MS for Little Kirsten, romance. 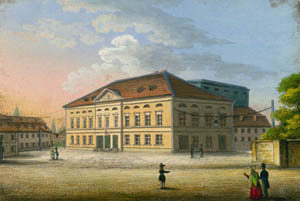 The Court Theatre in Weimar, performed in 1825. From H.C. Andersen’s Album. Andersen’s MS for the boardgame duet . The boardgame duet. The Royal Theatre, Copenhagen 1934–35. 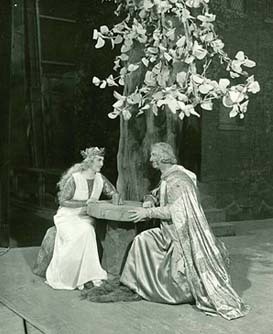 Else Trepiele (Little Kirsten) and Poul Vermehren (Sverkel).